CUYAMACA's MOSES SMITH at the line on Friday. 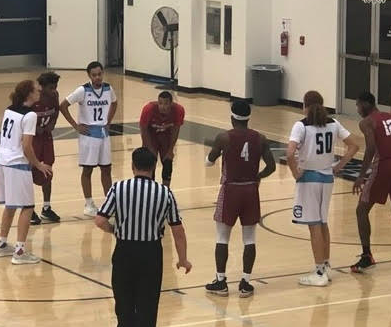 SAN MARCOS (1-19-2019) – College of the Desert and Palomar college were tied at 47-all with 9:38 remaining. But the tight, defensive struggle went the way of the visiting Roadrunners, as road ballclubs captured all six Pacific Coast Athletic Conference contests on opening night. COD broke the deadlock by going on an 8-2 run, then staved a late Comets rally to post a 68-64 decision Friday (Jan.19) at Palomar Dome. Palomar had a chance to get even in the final minute but made just 1-of-2 foul shots to still trail by a single point. Desert answered with a foul shot, then Sam Skipper scored on a putback following an offensive rebound to clinch the win with 6 seconds remaining. For College of the Desert (10-9 overall, 1-0 PCAC), Nicholas Pete led the way with 11 points and 11 rebounds, while Skipper and Riley Welch each added 10 points. Desert also held a 17-4 advantage in bench scoring. Palomar (6-12, 0-1 PCAC), which has dropped five straight (including the last three at home), saw Marek Sullivan dominate with game-highs of 21 points and an astounding 21 rebounds — the highest total of boards by any PCAC player this season. Predictably, all of the other home schools — except Grossmont — did not report their statistics to the CCCAA state website. But we found ways to gather some information from sources. San Diego City 68, Grossmont 56: At El Cajon, another poor first-half shooting effort saw the host Griffins manage just 4 buckets on 21 shots (19.0 percent), yet they remained in the game as the Knights did not fare much better, holding a ridiculously low-scoring 24-14 halftime lead. A more-traditional second half saw City post a 24-16 run to mount an 18-point lead to cruise to a win in the PCAC opener. “We went seven minutes in the first half without scoring and that’s the ball game,” Grossmont coach DOUG WEBER said. The Knights’ front line of Robby Robinson (18 points, 7 rebounds) and Joseph Riley (14 points) took advantage of the smaller Griffins., who could only counter with 26 points by Lamon Hudson (10-for-10 at the foul line). Chris Moyer, a sophomore forward from West Hills High, had 10 points and five rebounds. “It’s always tough losing but I’m really proud of the way we all played,” Moyer said. “City has a rep of being a tough team to beat but I felt that we all played our hardest and continued to do so until the last second. “We’ve come a long way from a couple months ago and I’m excited to see how we play through the rest of the season. SDCC moved to 10-9 overall (1-0 PCAC); Grossmont slipped to 3-16 (0-1 PCAC). Southwestern 72, Cuyamaca 59: At Rancho San Diego, the state-ranked yet disinterested Jaguars played well enough to maintain a double-digit lead throughout to stop the host Coyotes. Southwestern’s defense allowed just 7 baskets in the first half, mounting a 33-18 cushion at the intermission. The Jaguars have now won six straight head-to-head meetings with Cuyamaca. Both schools were contacted earlier in the week to supply game details. Neither school, including the directors of athletics, bothered to respond. No. 3 Mt. San Jacinto 1-6, MiraCosta 94: At Oceanside, The visiting Eagles were getting matched point-by-point from the Spartans before pulling away to take both teams’ PCAC opener Friday (Jan. 19) at Crosswoods Gymnasium. For MiraCosta (9-10, 0-1 PCAC), a pair of freshman led the team in scoring. Marcus Foster tallied 21 points, and Devyian Roberson added 20. Also, sophomore Tre Morgan had 17. MSJC is now 15-2 overall (1-0 PCAC). No report. San Bernardino Valley 72, at Miramar 63: No report. San Diego Mesa 86, at Imperial Valley 77: No report.